Goat meat is superior to other meats including meat and chicken. The only meat leaner than goat meat is the Ostrich. It is a common belief that red meat are bad for the heart due to high cholesterol content and white meat ( chicken and turkey ) are good. THE MEATY TRUTH - Goat meat is surprisingly healthier than any other meat we usually consume like beef. While it is a challenge to cook goat meat is because of its low fat content, it is good to know that goat meat is lower in calories, cholesterol and sodium! Goat meat is lower in fat than chicken, but higher in protein than beef. Goat meat outshines traditional meat sources in most areas: it's lower in calories, total fat, saturated fat and cholesterol. The low levels of saturated fat and cholesterol, combined with its high iron and protein content, make goat meat a good choice for anyone looking for a healthy red meat. It's a leaner, healthier choice when compared to equal serving sizes of chicken and beef. According to the United States Department of Agriculture ( USDA ), goat meat is lower in cholesterol and fat than chicken, turkey, beef, lamb and other red meats. According to research, in terms of fat, chicken has more than double the fat in goat meat and beef has six times the fat in goat meat. Numerically, goat meat has just 3% fat, turkey 5%, chicken 7.4%, beef a whopping 18.8% fat. A 100gram servings of goat meat contains 142 calories, chicken has 185, lamb has 205 and beef has 207 in the same servings. Compared to chicken, goat meat has 3gm fat,(0.93gm of saturated fat), 75 mg of cholesterol, 27gm of protein and chicken has 5gm fat,( 1gm of saturated fat ), 85 mg of cholesterol and 31gm protein per 100gram serving. Goat meat consumption may lower the risk of a person suspected to have inflammation in blood vessels, and stabilize the heartbeat. Because it is advisable occasionally coronary heart disease eat goat meat, but stay away from the fat. 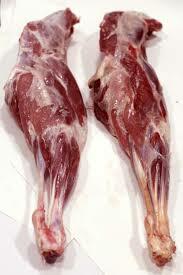 There is CLA in goat meat, which is a cancer-preventing fatty acid and avoid inflammation. 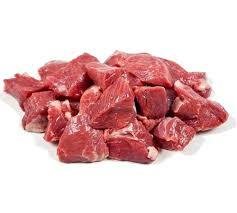 There is vitamin B in goat meat, which helps burn fat in your body. In addition, it is also high in protein, and lower in saturated fat than beef. It's good for you who are on a diet. 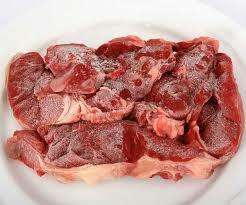 There are selenium and chlorine in goat meat which is beneficial to prevent cancer. Pregnant women are also good eating goat meat because it prevents anemia, give intake to hemoglobin, and helps blood circulation. Although many pregnant women are afraid to eat goat, but actually goat meat even prevent birth defects, as long cooked with good maturity level. For women who are menstruating, goat meat helps prevent anemia. Food from goat meat help keep from stress and depression because many contain B12. There is omega 3 fatty acid in the meat, and well consumed by children with autism. Low potassium and sodium, useful to control blood pressure, and prevent stroke and kidney disease. Calcium contained by goat meat is also good for bones. In conclusion, other than fish, goat meat is the healthiest and best meat to eat based on nutritional values of different meats and their impact on heart health. For the benefit of weight loss, you can consume fish, goat meat, skinless chicken in moderation, before considering other meats as a source of animal protein for a better results.